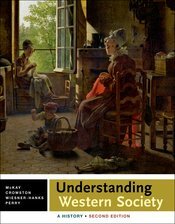 Understanding Western Society, Second Edition, features a brief, question-drive narrative that models for students the inquiry-based methods used by historians and helps students understand what’s really important to know about Western civilization. The second edition introduces LaunchPad, an interface that combines carefully curated new content, assignments, and assessments integrated with an interactive e-book. With LaunchPad, students have the option of reading the book in print or online and you have the technology to make class preparation a breeze. LaunchPad includes all the primary sources from Sources of Western Society, as well as LearningCurve, an automatically graded adaptive learning tool that students love to use to cement their understanding of the text and instructors love to assign to prepare students for class. LaunchPad also has a wealth of activities and assessments that help students make progress towards learning outcomes: map and visual activities, auto-graded quizzing, guided reading exercises, and carefully developed Online Document Projects. LaunchPad is easy to use and can and can be integrated with your school’s course management system, giving you the tools for enhanced teaching and learning.